I never, in 100 years, ever would have guessed I’d be spending hours hunched over a sewing machine, completely engrossed in what I’m doing. Never ever. 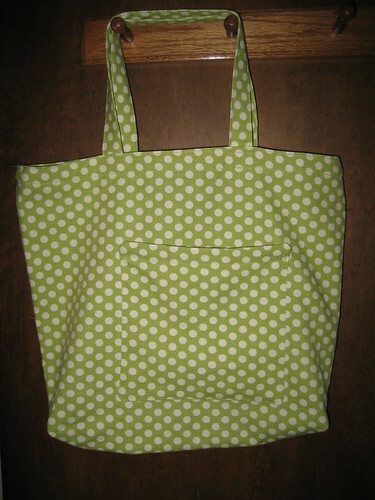 But I am, and it’s ok.
At any rate, two projects done at this point, neither of which involve quilting. 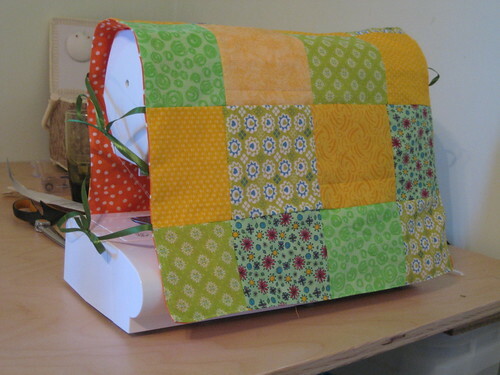 I found myself entirely daunted by the prospect of squaring up all those little blocks and arranging them into an attractive pattern, so I put all the quilting stuff into a few drawers and took a step back. 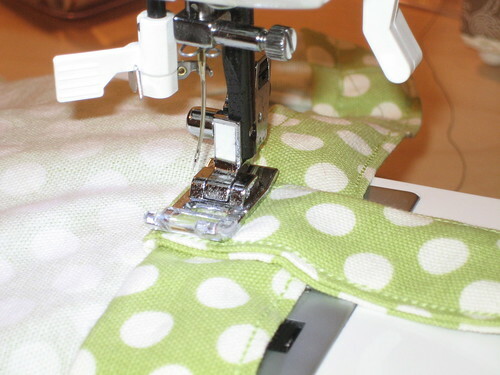 Before I attack the squaring and the whatnot, I’d first better learn how to sew. Thus, I found myself a few easy little projects. I managed to finish each in an evening, remarkably enough, and while they both definitely have their problems, I’m pleased they weren’t complete disasters. There are definitely a lot of imperfections on mine, but overall, not too bad, right? Kinda cheery and bright. Go team! Other photos of the process of the project are on my Flickr account. When I was attaching the handles, I had to call in Mike Neir for a consult, as my 3D relational brain was off-line. “If I attach it like this, is it going to be twisted when I turn it right-side out?” Mike, in sewing as in all things in life, serves as the go-to guy for such questions. 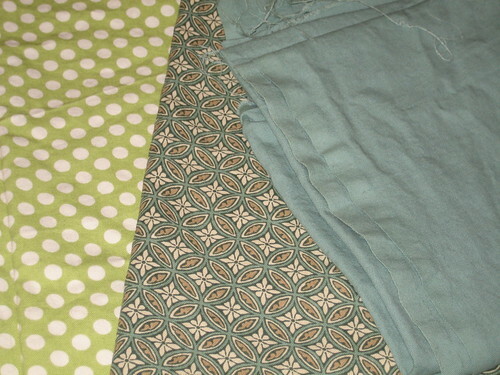 In theory, I had enough fabric for two, although I may have dorked up the cutting part again and end up short. Still, I’d change a few things the next time around, like making the front pocket a different fabric, so it contrasts and stands out more, and make a larger, squarer bottom. I’m not entirely sure how to pull off the “squarer” part, but the “larger” should be easily enough accomplished by simply stitching the gussets farther from the edge… right? Later in the day today, despite a raging head, I found myself at JoAnn Fabrics for their Labor Day Sale… what a mixed blessing that was. On the one hand, I got a ton of free and/or reduced-price stuff, saving myself $100 in the process. On the other, there were all these other, crazed women there. Line at the cutting counter. Line at the cash register. Fortunately, everyone was behaving civilly and I wasn’t forced to eviscerate anyone with a seam ripper. Well naturally, I had to have it. I found a matching material for the liner and I’ll be off to the races… at some point. My sewing machine started clicking and clacking tonight, which I’m assuming means it wants oil, but I’ve completely misplaced it. Thus, the next project (a slightly more advanced take on the same theme, really) is on hold until I either find the stinking bottle I already have, or run out and get more tomorrow. It’s late, I’m sleepy, good night. Lol – lady, if I get any good at this, I will make you whatever your little heart desires. 😀 I actually found some stuff yesterday that made me think of you for stocking stuffers, too!